There are many natural remedies that have been used over the years to help aid in the reduction of puffy eyes. Check out the following list below for things you have at home that will reduce eye puffiness. 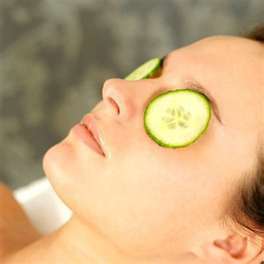 Cool cucumber slices, one for each eye, applied for about 5 minutes. Lavender as a soothing topical treatment applied to the eye area or in a floral water mixture can reduce swelling. Chamomile, green tea or other cooled tea bags placed on they eyes for about 5 minutes. If you use eye cream in the morning, try keeping it in the refridgerator for a cooling am eye treatment. Sleeping on a slight incline with an extra pillow to reduce morning under eye puffiness (also helps relieve heartburn too). Keep two clean spoons in the refrigerator to decrease eye swelling. In a pinch, two spoons can be placed in a glass of ice water to chill them on demand. Choose the treatment best suited and based on what you have on hand to help get rid of your puffy eyes. Once you have completed that treatment you can apply makeup to help hide any remaining puffiness.